Boasting a convenient location near downtown Pigeon Forge, tons of scenic hiking in the Great Smoky Mountains National Park, and mountain views from the deck, A Wolf’s Den is your dream cabin for your next family vacation, Smoky Mountain retreat with another couple, or wedding party getaway! 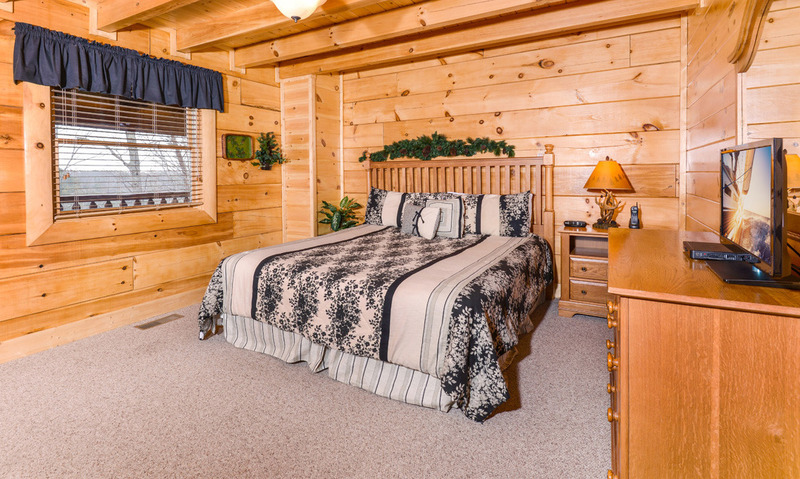 The 2 spacious suites with king-size beds lend guests homey places to unwind and relax after each exciting day in nearby Pigeon Forge, under 5 miles away from the cabin’s front door. 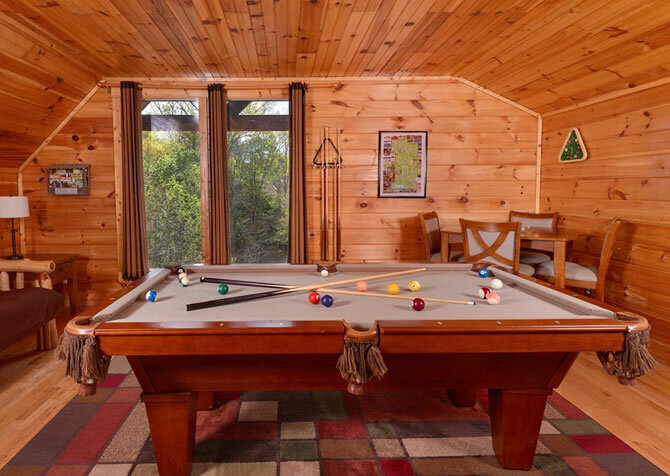 Plenty of entertainment awaits in the cabin, with wireless internet access, NFL Sunday Ticket to play on the large flatscreen TV with a sound system, and an amenity-packed rec room boasting 2 TVs, a pool table, air hockey, foosball table, and cozy couch to hang out and relax. Enjoy community pool access year-round to Bear Creek Crossing’s indoor and impressive outdoor pool with peaceful waterfalls in the backdrop. 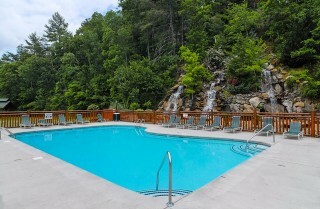 Your Smoky Mountain vacation would not be complete without some relaxation and rejuvenation. Luckily, A Wolf’s Den supplies ample ways to unwind and reconnect with yourself and loved ones while escaping to the Smokies. Soothe tired minds with a relaxing soak in the large indoor jetted tub each evening or sit back and soak in the incredible mountain views from the bubbly waters of the outdoor hot tub on the deck. Spend slow-moving mornings with fresh coffee from the fully loaded kitchen’s coffeemaker while lounging in the rocking chairs, listening to the soft songs of the birds. Gather in the living room with glasses of local wine or hot cocoa while seated around a warm fire in the impressive stacked-stone fireplace before heading to bed to rest each tranquil evening of your stay in A Wolf’s Den. Spend quality time together in the cozy atmosphere of the living room in between hiking, eating, and exploring in downtown Pigeon Forge! 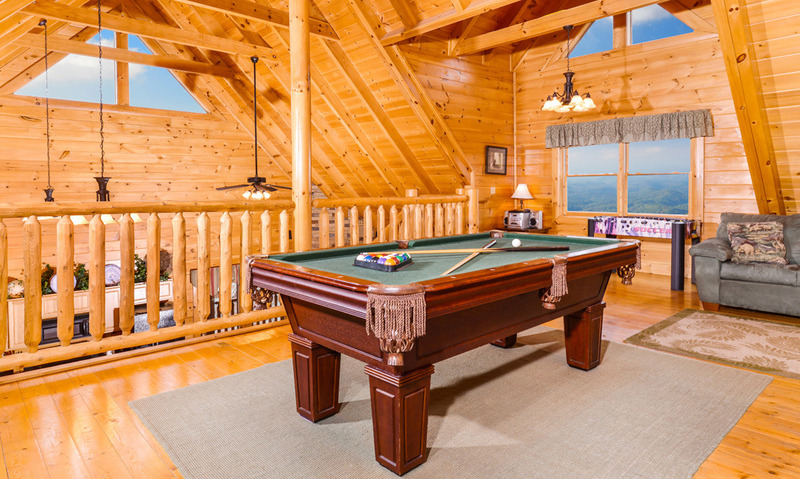 Cushy sofas and a large coffee table provide the perfect game night locale to laugh, drink, and create some of your favorite Smoky Mountain memories. 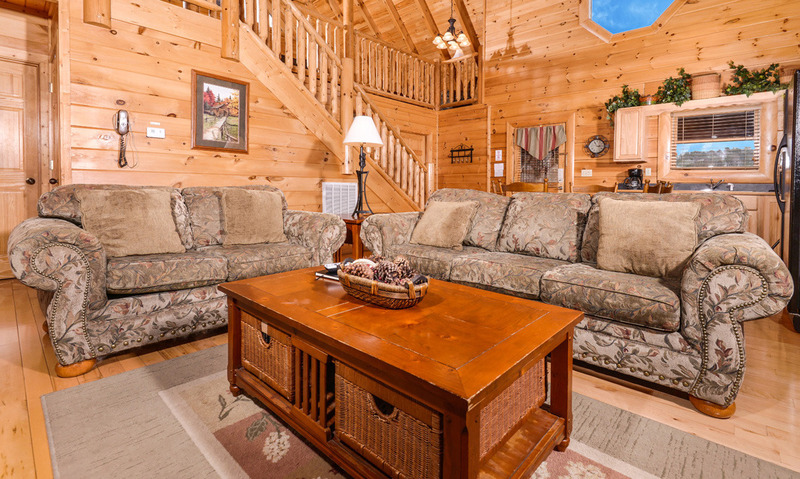 Pull your feet up and sink into the couch while enjoying NFL Sunday Ticket games on the large flatscreen TV with a soundbar and speaker system on relaxing afternoons in the cabin. 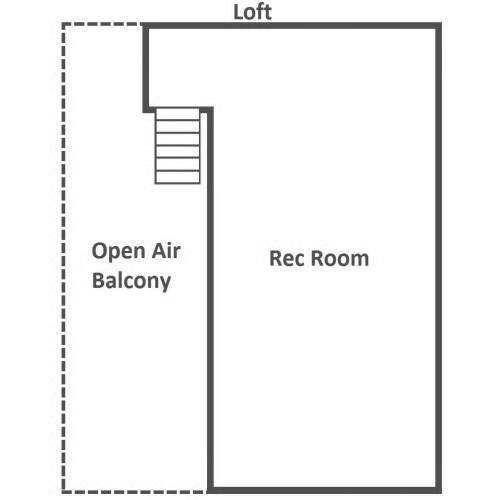 With high ceilings and large windows, the living room is great for a midday nap in the soft natural sunlight drifting in through the glass. 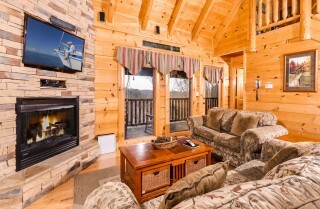 At night, simply click on the electric fireplace to enjoy a quiet romantic evening by the gorgeous stacked-stone fireplace with a bottle of wine from Mountain Valley Winery once the kids have gone to bed. 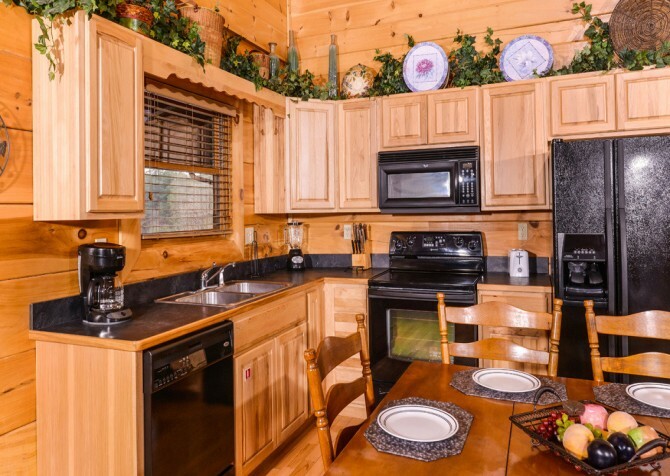 Whether guests want to save money with homemade meals or want simple, quick snacks in between large Smoky Mountain restaurant meals, the fully loaded kitchen provides everything necessary, from cooking tools and dinnerware to modern appliances. 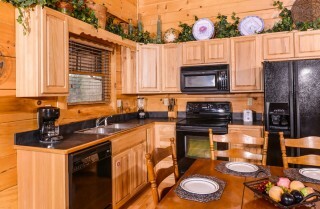 Natural wood cabinetry flanks sleek black appliances and countertops, lending a mountain-motif to the homey, open-concept kitchen. 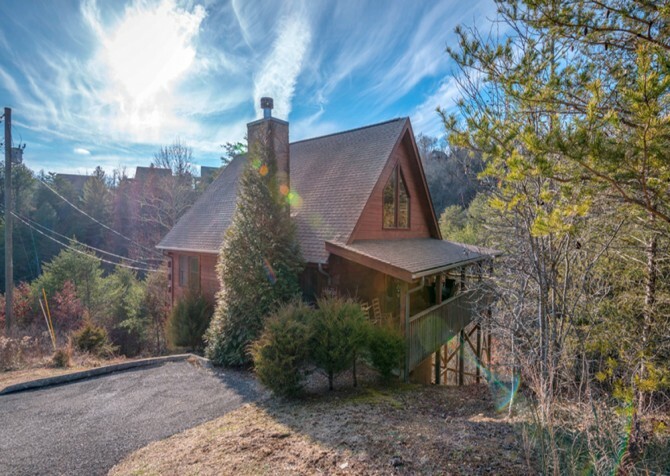 Create breakfast smoothies in the blender before heading out for scenic hikes to Rainbow Falls or Andrews Bald, or flip pancakes on the stovetop and toast bread in the toaster to enjoy large, savory breakfasts before sinking into the living room couches and rocking chairs on the back deck. Keep leftovers from large meals at The Old Mill and The Peddler Steakhouse in the full-size refrigerator to reheat in the microwave as great solutions to those midnight cravings or snacks between meals. 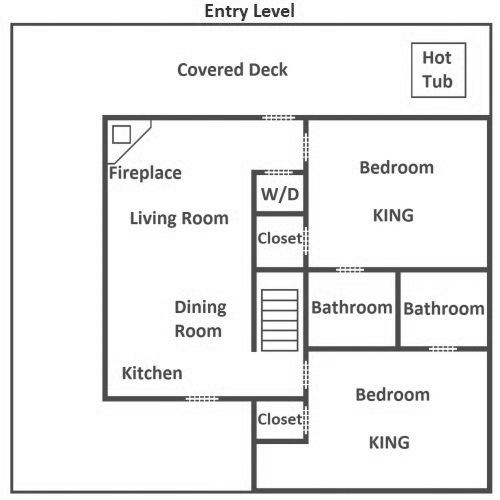 The coffeemaker provides the perfect and convenient pick-me-up without spending tons of money or going in search of coffee shops. 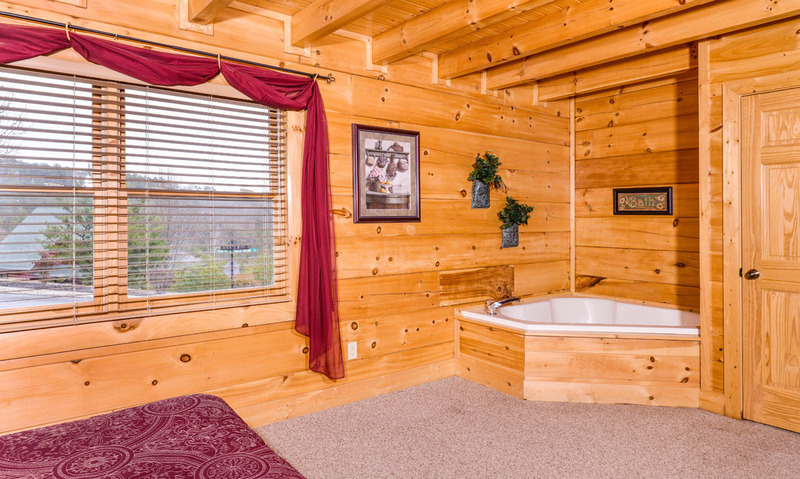 And of course you’ll want a place to keep all that decadent Smoky Mountain fudge and taffy! 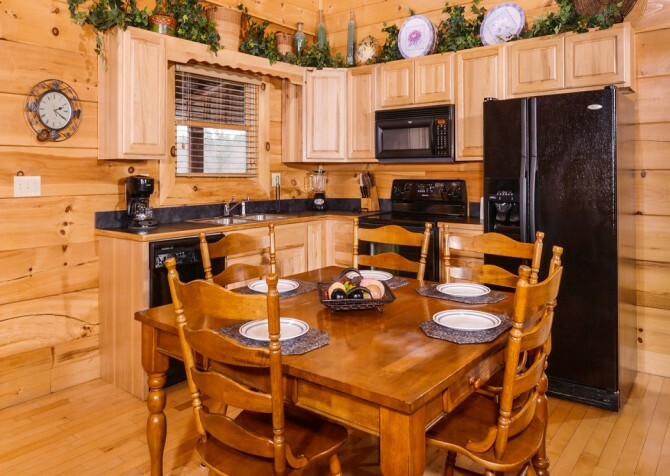 Gather around the gorgeous 5-chair wood dining set for quick meals, daily plans over coffee, and big, multi-course meals with friends and family. Situated in the kitchen, the dining table is perfect for grabbing seconds or enjoying football on the living room flatscreen while eating snacks at the dining table. After meals, clear the table to begin family game nights with easy cleanups thanks to the help of the kitchen’s dishwasher. 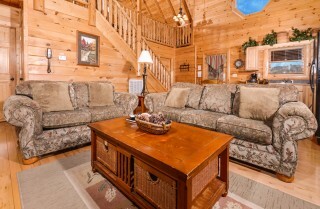 During breakfasts in the soft natural light floating in through the windows, take time to plan each days’ adventures in Dollywood, at Foxfire Mountain, or to Gatlinburg. Cozy furnishings, big king-size beds, direct bathroom access, closets, and flatscreen TVs await guests in the 2 homey bedrooms of A Wolf’s Den. 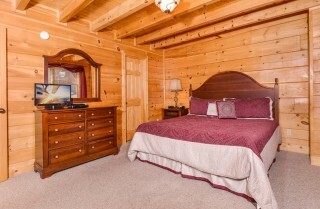 Crawl under the covers after long days in the Great Smoky Mountains National Park and let your mind wander as the soft sounds of the bedroom TV or soft mountain breezes outside the windows slowly lull you into rest. In the master suite, a large indoor jetted tub is the perfect solution to any sore muscles or stressed mind before sauntering into bed for the night. Unpack suitcases to feel more at home during your stay and have easier outfit changes between hiking in Cades Cove and dinner shows at Dolly Parton’s Stampede. Extra guests are afforded restful nights of sleep as well, with 2 large sleeper sofas located in the living room and loft rec room. Entertainment is never hard to find while staying in A Wolf’s Den! Play the kids in foosball or challenge a friend to some air hockey during cabin downtime. 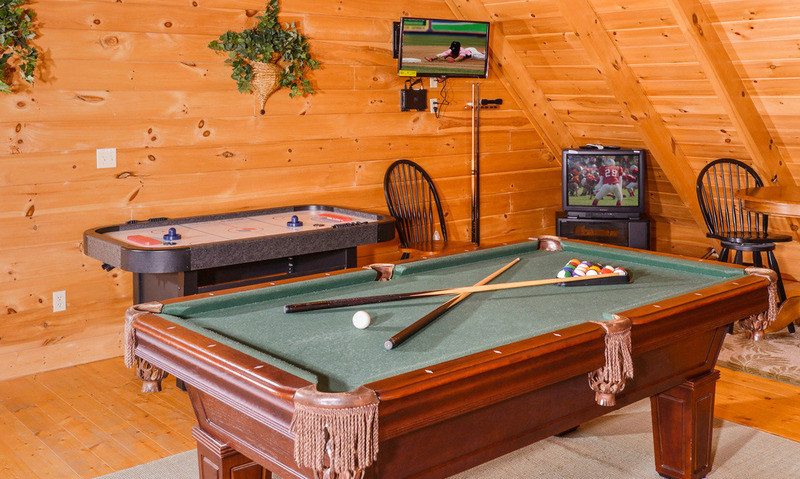 Shoot pool and sip on cold, crisp beers while enjoying multiple games on the 2 TVs located in the rec room. 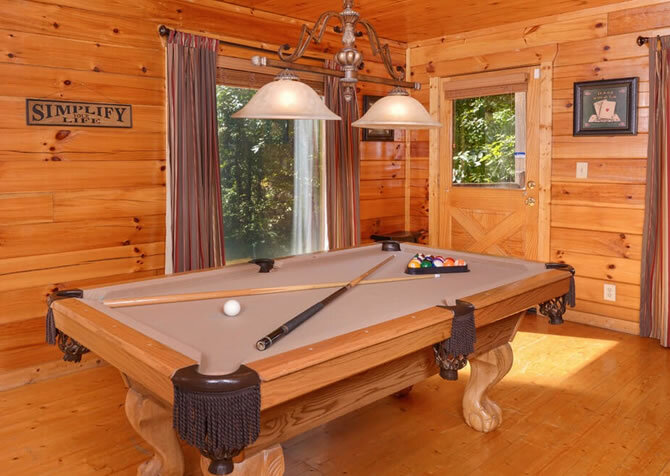 Wait your turn on the pool table or simply kick back on the couch while watching the kids play together before heading to the dining room table for family dinners each evening. 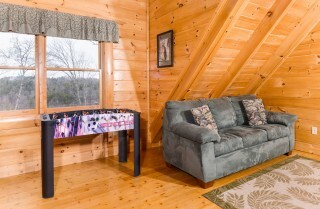 Escape to the loft’s cushy couch to finally finish that book or listen to a podcast on your smart device using the wireless internet while other guests watch TV and hang out in the living room. Host cabin cookouts and outdoor games on A Wolf’s Den’s spacious wraparound covered deck, rain or shine! 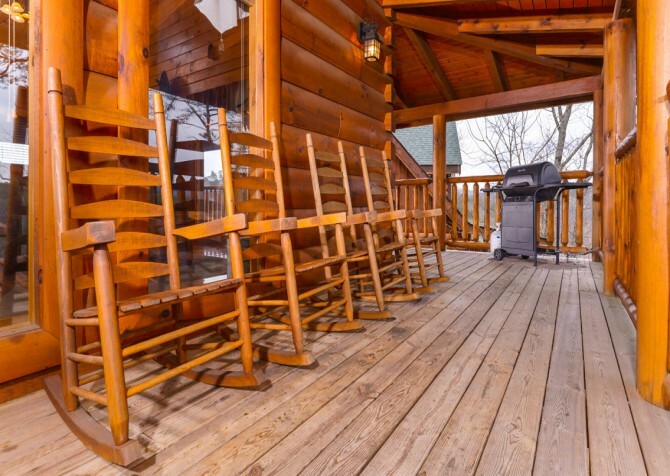 Flip burgers on the gas grill while the kids play their favorite outdoor games from home and other guests sip on cold beer while lounging in the rocking chairs. 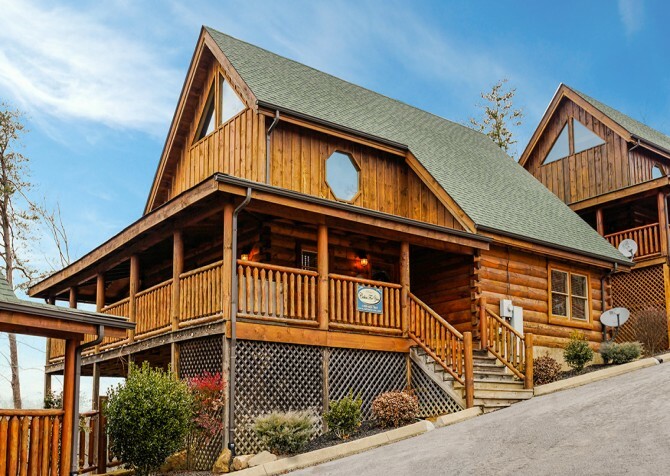 Sit back, sip on warm cups of freshly brewed coffee, and take in the peaceful Smoky Mountain views on easy-going mornings before gathering for another exciting day in downtown Pigeon Forge at The Island, Wonderworks, and The Old Mill District. 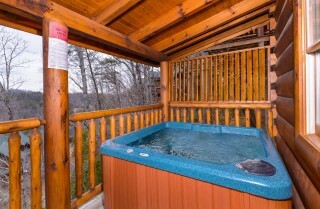 Unwind after thrilling rides in Dollywood or adventurous kayaking on the Pigeon River with soothing evening soaks in the bubbly waters of the outdoor hot tub while dusk slowly fades to night over the mountains. On hot summer days in the Smokies, cool off with a dip in Bear Creek Crossing’s outdoor pool, and on cool, crisp winter afternoons, take the kids for a fun time in the indoor community pool! 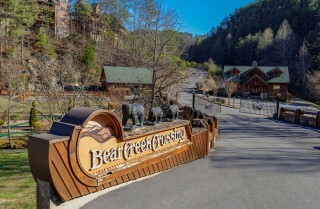 Whether you are totally new to this thrilling sport or want an adrenaline-pumping adventure, look no further! 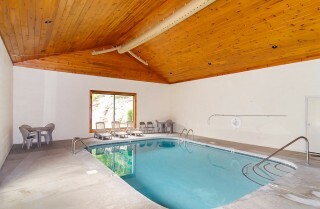 The powerful winds of the vertical tunnel keep you afloat in mid-air without ever jumping out of a plane! It’s been her life’s goal to keep guests to her home state smiling, so get ready for a day filled with joy and excitement while riding roller coasters, watching parades, eating savory treats, and more while visiting the famous Dolly Parton’s incredible theme park! 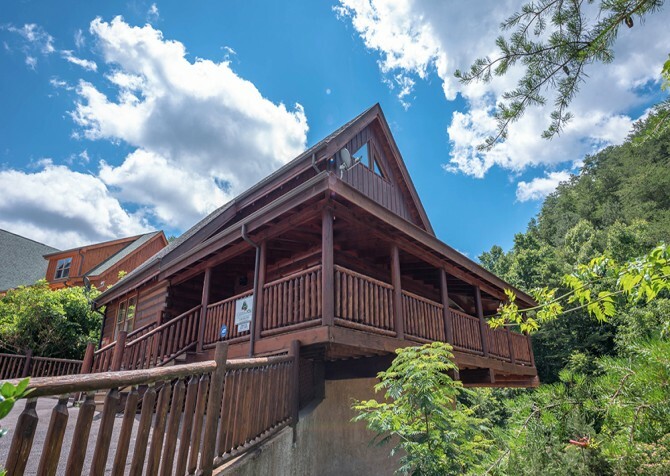 From long hikes along the Appalachian Trail to a short, paved hike to Laurel Falls, there is hiking for every visitor to the Smoky Mountains! Gorgeous waterfalls, lush forestry, rapturous rivers, and sweeping mountain landscapes – get outside and explore during your cozy Cabins for YOU stay!